The Act of Killing is a part of the Sydney Film Festival. 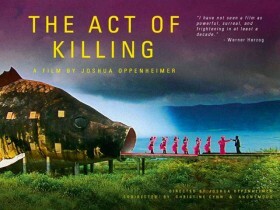 The Act of Killing is a history making film, a documentary that has the voltaism to genre-cross into all forms of film making and leave its mark. This is the film that Wener Herzog and Errol Morris – arguably two of the best documentary film makers alive today – leaped to signed on as executive producers as soon as they saw it. This gives some context, when no adverb is adequate, to describe this film that presses into the extremities of film making is capable of. On the thirtieth of September 1965, a self-proclaimed organisation of Indonesian National Armed Forces assassinated six Indonesian Army generals in an abortive coup d’état. 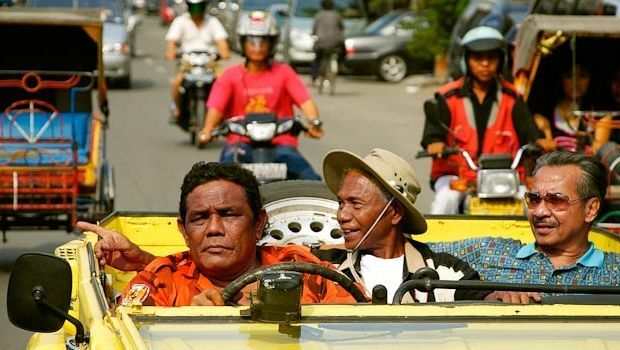 Later they claimed they had taken all media outlets and had president Sukarno under their protection. By the end of the day, two more officers were dead and the coup declared unsuccessful. However in the ensuing weeks, the communist party were blamed for the uprising. Sukarno was placed under house arrest (he was seen to be favoring communists in democratically led Indonesia) and the army, led by Suharto ran a twelve month anti-communist purge that eventually led to Suharto wresting power from Sukarno and becoming Indonesia’s second president. At least one million people were murdered in the anti-communist purge in the twelve month period between 1965 and 1966. The killings were carried out on behalf of the military by local gangsters who were given unprecedented power to capture, judge and slaughter anyone they decided was a communist. These gangsters extended this operation to an extortion racket against the local Chinese to help fund their organisations. This regime was never overthrown, and the military based right-wing government has maintained the power position of the gangsters (nationally celebrated as “Free Men”) in order to keep tight control over the people. Initially it was Oppenheimer’s intention to travel to Indonesia and interview the victims and survivors of the 1965 cleanse. However this proved very dangerous, not just to Oppenheimer but to those brave enough to speak out. A survivor suggested that Oppenheimer focus on the stories of the gangsters, specifically those who carried out the slaughters, and tell their story.It was the survivors contention that the gangsters would boast and reveal far more than they might realize. After agreeing to change the trajectory of the film in 2003, the flood of offers from gangsters keen to tell their stories (the nation sees them as heroes) and swagger about in front of the camera amazed Oppenheimer and the information available went from scarce and secret to open and abundant. Anwar Congo, the forty-seventh applicant was the one eventually settled upon, and it is his story that is re enacted for the camera. But above all, and something Oppenheimer didn’t expect until he met these men, is the desperate pain they live with as a result of their actions. It is here that the films great twist takes an astonishing turn and reveals the power of films to touch our lives. These gangsters often performed their acts of terror in the context of film. they would go and see American gangster films, and then cross the street to perform murders, while they were still on the happy high of the film. They use these same films in their re-enactments, and the viewer watches as the power of films to give context and a kind of permission is revealed. Deeper again, is the relationship Congo and Hermann (and some others) have with the film making process themselves. In a deeply moving scene, Congo can’t continue “acting” as the victim, as he is too traumatized – even though at the time he was the perpetrator. 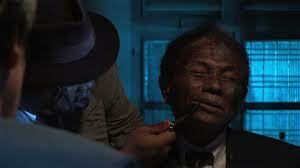 Later he says to Oppenheimer (always behind the camera, and yet always present in the film) “I really felt what they felt” and Oppenheimer suggests to him “but deep down you knew it was a film, and they knew they were going to die.” To see Congo break down – completely – is astonishing. He cries, but his body turns against him also, dry reaching, convulsing and becoming immobile. The gangsters speak openly about the techniques they used to free themselves from the pain of their memories. At different moments they will defend, deny and declare their actions as good, or bad. However, what is always present is the nightmares, the memories that can’t leave, and the blood on their hands that won’t wash off. This is obvious to the viewer, as is the capacity within ourselves to do good as well as evil. 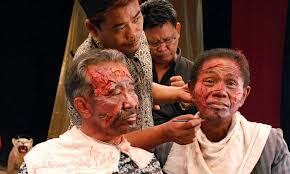 The Act of Killing is not just a documentary about the horrors that took place in Indonesia in 1965. It is about the regime that controls the country still, and the terror that common people live with. It is about the human creature and the power of story telling. It is about the human capacity for profound good and profound evil. 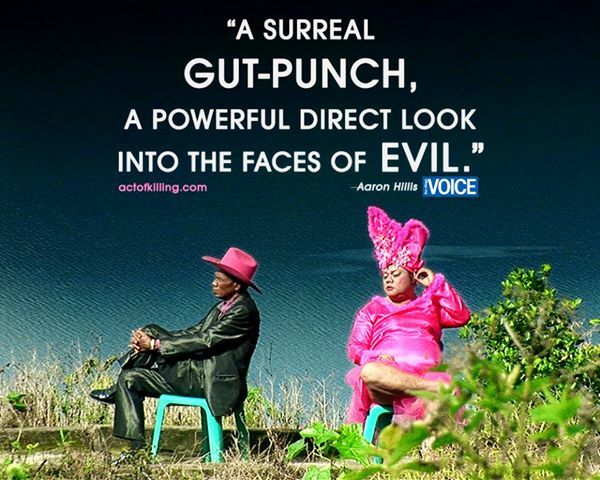 It is about the remarkable ability of film to reach people and it is about the unifying voice of a single human cry. This is one of the best films you will ever see.